These days there are noticeably more people in the International Slavic Centre in Chernigovsky Pereoulok. The Orthodox Moscow hurries up to see artist Victor Loukianov’s paintings, for the first time exhibited in the capital of Russia. They were already seen by admirers in Bulgaria, Serbia, and Tajikistan. In the days of celebrations in connection with the 1000th Anniversary of Christening Russia, there was a personal exhibition in Kolomna. But it’s this current exhibition in Moscow that the painter considers his debut. Pictures of different years are presented here. 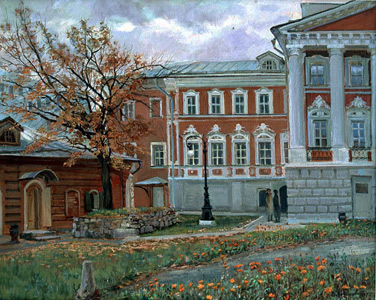 On the second floor of the Centre there is the Moscow series, portraits, and miniatures – 250 works all in all. Graphics is also presented. Through the years of creative work, Victor painted hundreds of pictures, and only for lack of space not all of his pieces are exhibited; but even this comparatively small part of the artist’s creative work gives us the opportunity to see the depth and singularity of his talent. He was born in 1957 in Moscow. 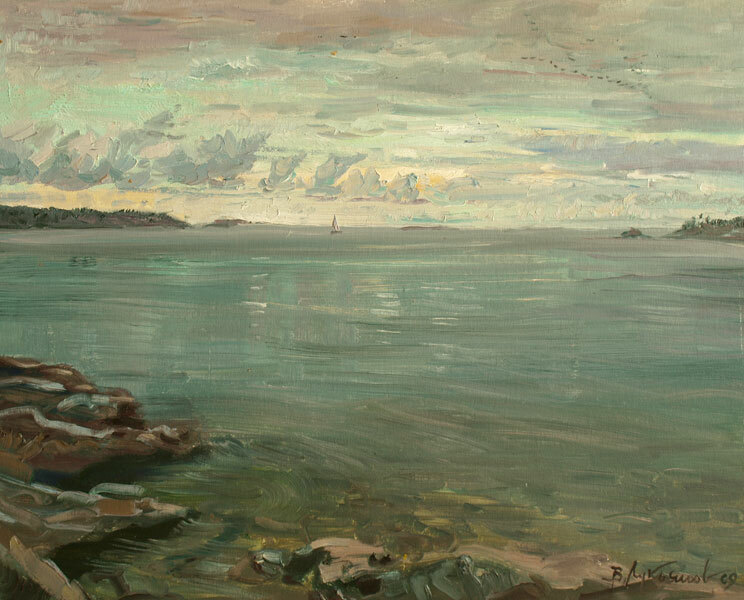 His teacher was a wonderful painter Dmitry Vasilievich Pashintsev. For many years they enjoyed both personal and creative friendship. Later Victor walked along his own way of experimenting, mistakes, and search. Now that the artistic «handwriting» of the young master is already recognisable, his creativity is open to many various artistic manners; but the main direction is easel painting. 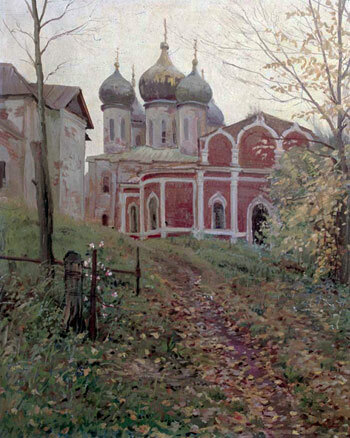 The book of opinions is full of grateful comments: the World of harmony and beauty, created by Victor, the is leading away from sorrows and sadness to the ringing Autumn sadness of Moscow churches, quiet side-streets not yet oppressed by block vast bulks of modern construction, is indeed wonderful. Among the chamber paintings, the «Night» of the Uglich series is most attractive. With all its combinations of violet and rose (not at all typical for the modern painting) is still very alive, but only pierced with dead cold. And there in the night, a small star is twinkling to us. Like in the long, pitch-dark shower rains, one feels the love for the Sun deeper, like looking at the frozen Christmas night, one can’t fail understanding – there is no death in the far-away Bethlehem. This is possible the way, that the idea of God’s Mother Cover guarding our Motherland is being brought home to us by the Providence through constant temptations, sorrows and pain; only by overcoming them the Soul stays alive for the Eternity. 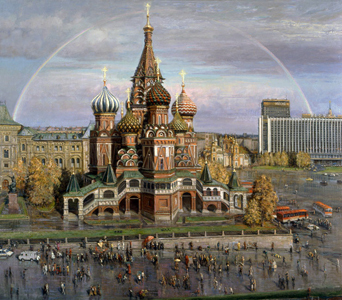 Among the genre paintings, the latest piece by Victor «The Cathedral of the Virgin Protectress» , that is on the moat (St. Basil’s Cathedral). The Red Square in front of the cathedral is filled with the modern Moscow fussy public: photographers with their «presidents» of plywood, pictures traders, ice-cream sellers, some kind of preachers, guru… And rising all over it is the Cathedral, and is throwing the shade of the Cross over each stone. Centuries rushed by, but this creation of men in honour of God is still standing steadfast. The godless destroyed the sacred relics of St Basil, but the Grace stayed. No matter what sabbathshappened on this land – the Cathedral is standing, staying a patient silent witness to human concentration on the momentary. The historical theme at the exhibition is represented by the piece «Boris Godunov». The painter was scrupulously working at it for several years. The problem of power and conscience is reflected in this painting, and involuntarily one can see reality of our times in the historical painting. A series of beautiful portraits is also a decoration of the exhibition. Among then, «Nastya» draws one’s attention. A gentle, quiet beauty, tenderness itself, but one can feel that she will be able to stop a racing horse and to enter a burning house. 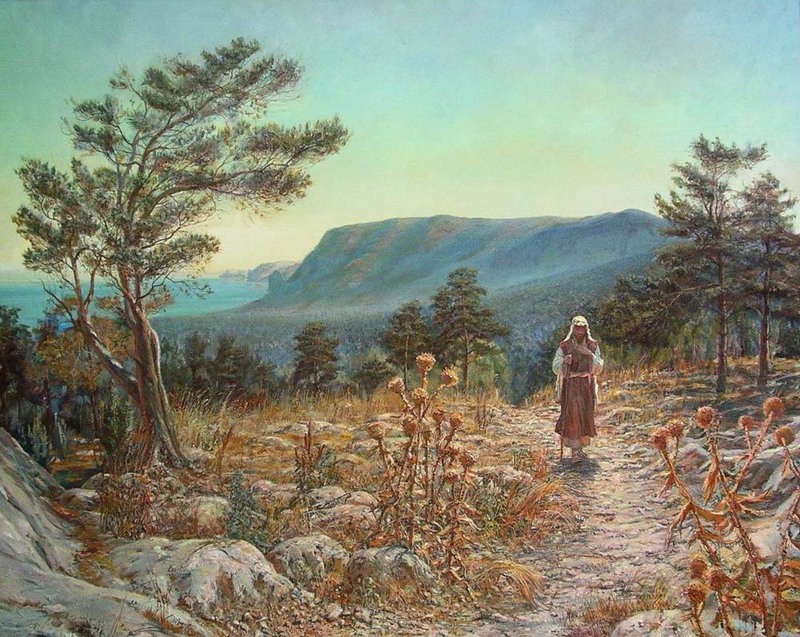 A special theme of the painter – the landscapes of the Southern Bulgaria, its ancient cities: Plovdiv, Smolena and others, where he lived and worked for almost a year. The southern nature is if dictated another artistic manner. The paints are more dense, half-tones disappeared, everything has become more definite, exact. After a closer look at the paintings, it becomes clear that in the last years the painter turned from dark to lighter colours. And here is a certain sign of the time: «The church is rising». 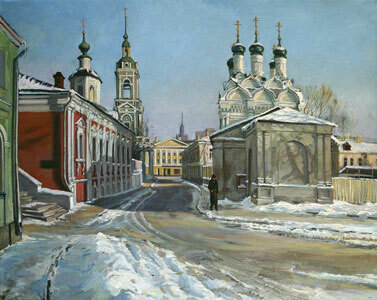 In the same Kolomna, beloved by the author; the territory of the Golutvin Monastery is given to the management of the Metropolitan Krutisky and Kolomensky. Destroyed, neglected churches are being restored. All around Russia. It seems, the spiritual hunger is being satisfied. Paintings by Loukianov are especially dear because they serve as a reproach to the past and a memory for the future; and today they are becoming (and very fast) history. They do not pretend to be a new word in painting. They are just the World where sincerity and truthfulness are opening the doors of ancient and eternal truth. According to the artist himself, painting has become for him a Wonderful world. He goes there in the times of joy and sadness, each time encountering with the great mystery of transformation. And then the variety of material life combines with symbolic laws, and it’s hard to understand, where there is a paint and where – the colour, and how it becomes the light, and how a live man appears on the canvas. In one word, for the painter it’s not a craft, for him it is life – with thoughts, hopes and dreams. Of course, one should not mix gospel truth with the language of painting. But everyday Life asks questions, the answers to which it’s not useless to look for, at this exhibition.